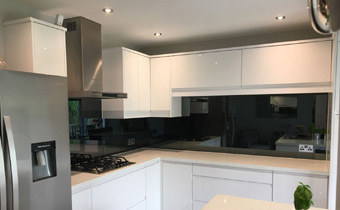 As one of the leaders in design and up to date technology, Splashbacks of Distinction are always on hand to deliver the highest standards of quality and service to our valued customers. 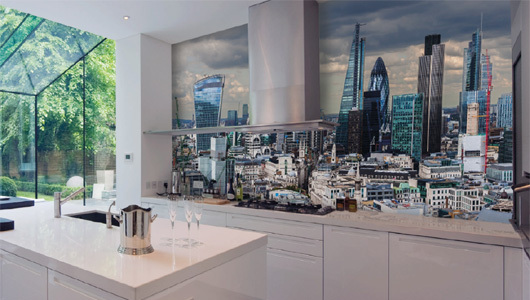 Splashbacks of Distinction provide a wonderful product that is suitable for kitchens, bathrooms, office spaces or anywhere you want a true touch of class. Our splashbacks will add value and style to new and old kitchens and bathrooms. They are easy to clean and very hygienic. Every piece is toughened when manufactured so it is heat, water and impact proof. A glass splashback and worktop will complement any bathroom, kitchen, bar area, laundry or shop. The sleek and seamless surface is the ultimate in elegance with zero visual interruption. 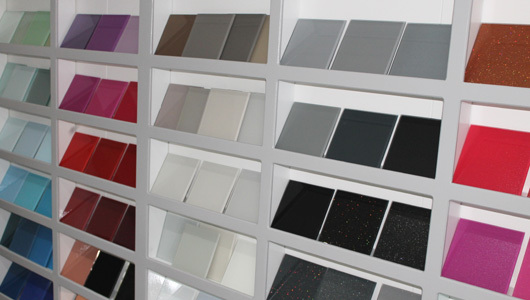 Our glass splashbacks and worktops come in any colour and are also far easier to clean than ceramic tiles. Should you require our services, please call or contact us by completing the simple contact form and we will get back to you as soon as possible. 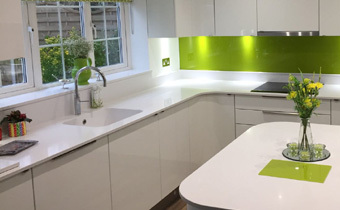 The Splashbacks of Distinction show room is located at Watton at Stone in Hertfordshire with easy access from Hertford, Stevenage and surrounding towns. It is close to both the A1 and A10 which makes it easily accessible from North London. We have a wide range of samples, styles, colours and textures for you to see and touch. Our clients have told us that being able to visit our showroom really helps them to visualise and develop their ideas so that they really end up with exactly what they wanted. 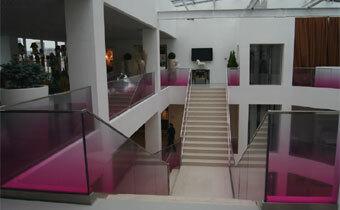 Our workshop is next to the showroom so you can also see our products as they are manufactured. We have also created a stunning brochure with a selection from our range. This is available to download as a PDF by clicking on the link below. The possibilities are almost endless. Whether you wish to modernise your home or office space, enhance it or create an eye-catching element in one of your rooms we are here to make your dream come true. Your wish is our command. 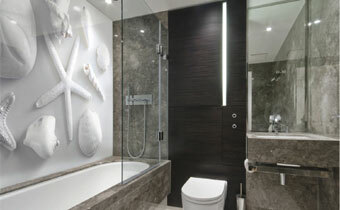 Perhaps a tropical landscape in the bathroom? 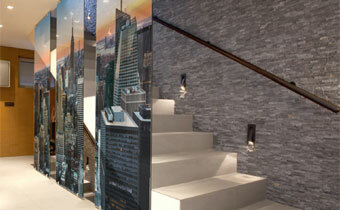 How about a stylish banister or wall art? Or even a state-of-the art room divider? If you own a business you might want to create a new inviting atmosphere for your customers or upgrade your existing space, making it uniquely stylish. 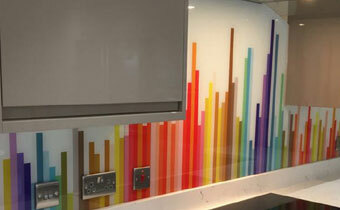 At Splashbacks of Distinction we can even recreate different surface patterns too. That wood-style surface you always wanted is now possible and it comes with all the advantages of glass. 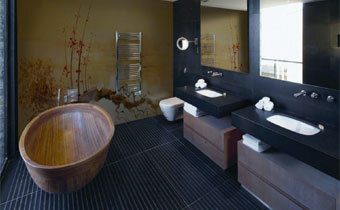 Our customers also love our granite and marble styles which are perfectly stunning. When it comes to Mirrors, in either a Kitchen or Bathroom, nothing quite rivals the open, light and clean look that such a simple product offers. 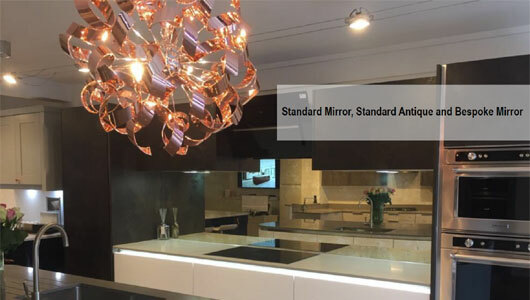 Splashbacks of Distinction offer a range of standard mirrors available in Silver, Grey, Bronze and Peach with toughened options available. Our bespoke antique mirrors offer depth and character, reflecting the beauty of its surroundings as well as enhancing them. Our collection of six unique mirrors can bring depth, glamour and a unique look to any space. Choose from our range of antique mirror styles including moon, lava, mercury, Neptune, vincenzo, bronze vincenzo and bianco nero. Why not view our brochure or contact us today to see what we can do for you. It is often very difficult to see what a particular colour or finish will look like from a picture. We understand that and can supply samples of your chosen splash back to enable you to get the best possible idea of what your dream kitchen or bathroom will look like before it is fitted. We already have hundreds of samples available to look at in our showroom including different types of finishes such as glitter or sparkle. 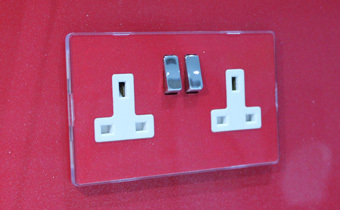 We can supply a sample in any colour or finish you would like from our extensive range. 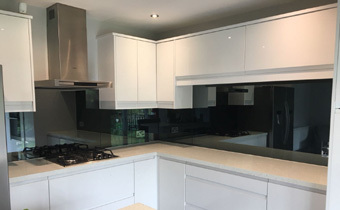 Our splash backs are often so vibrant that it is very difficult to really appreciate them from a simple image and with some finishes, such as the mirrored finishes, it is virtually impossible. With a sample you can get a much clearer idea of how your splash back will look in your kitchen and how it will compliment the other colours and textures around it. 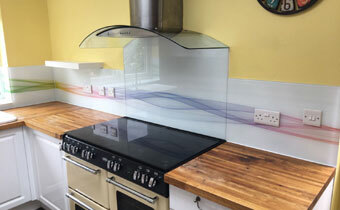 At Splashbacks of Distinction we carefully manage the complete production, design and fitting of our bespoke, designer glass splashbacks. Great care is taken to measure the intended space and our team will discuss your requirements and help with any ideas you have. 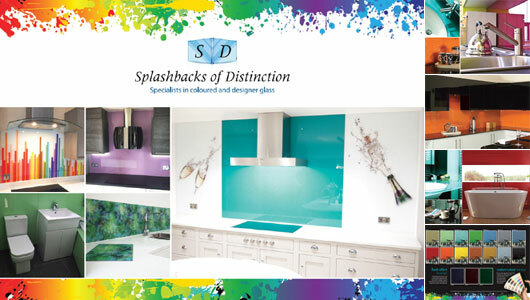 Once we have finalised your design with our team, Splashbacks of Distinction can start to make the magic happen. At every stage of the production process each of our panels is quality checked. Once one of our panels has left our workshop, we at Splashbacks of Distinction transport it and install it. Because each design is unique, it requires specialist knowledge to ensure correct fitting. 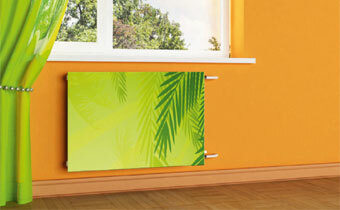 Our team of experienced fitters will ensure that the panels are correctly aligned and mounted. We won't be happy until our customer is completely happy with the result. Our team will work closely with you to create your dream design, ensuring the highest quality from start to finish so you can look forward to the magnificent result. We take pride in maintaining the highest of standards so that you, our customer can enjoy the beauty of our bespoke products. 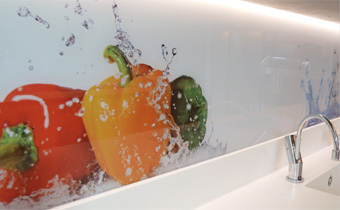 All of our glass splashbacks and panels are made using toughened glass. The glass is processed in accordance with the requirements of the relevant British and European quality standards BS EN 12150 : 2000 (Impact Tested BS EN 12600 : 2000). 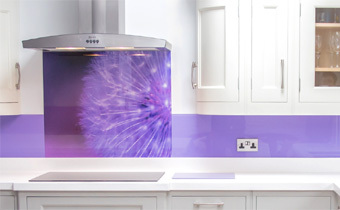 You can rest assured that our glass splashbacks are safe and of the highest quality. 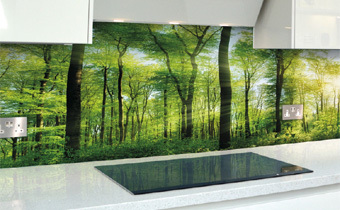 Splashbacks of Distinction carries out rigorous checks to ensure that each panel is of the highest standard. 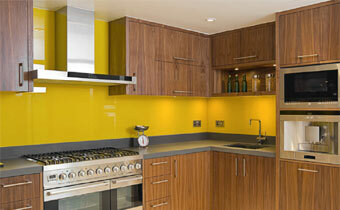 At Splashbacks of Distinction we make sure that every panel is correctly aligned and fitted. 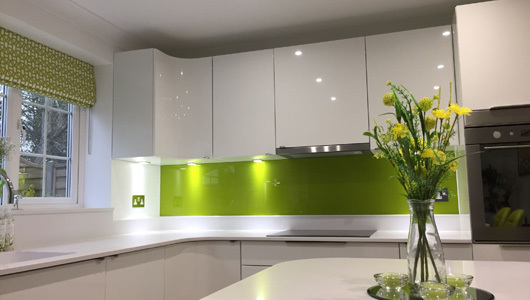 Our toughened glass splashbacks are made to withstand daily use and will provide you with a strong, durable surface whilst maintaining their wonderful appeal and elegance. Reflecting natural light and brightening up dark corners, the splashbacks create an inviting, vibrant atmosphere. 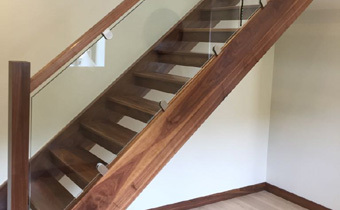 Whether as a wall in a shower, as a room divider or a banister, our toughened glass will not let you down. It provides an excellent sealed barrier in kitchens and bathrooms where steam can cause havoc to walls and plaster. Very professional and helpful service at every stage from choosing and ordering through to measuring and fitting.